"It is a particularly exciting find because all three planets are of low enough mass to be potentially rocky and have a solid surface, and the middle planet, Wolf 1061c, sits within the 'Goldilocks' zone where it might be possible for liquid water—and maybe even life—to exist," says lead study author UNSW's Dr Duncan Wright. "It is fascinating to look out at the vastness of space and think a star so very close to us—a near neighbour—could host a habitable planet. 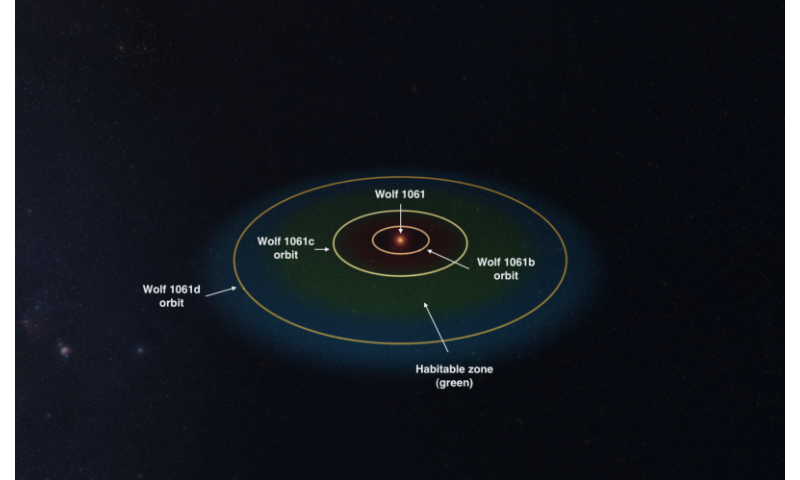 "While a few other planets have been found that orbit stars closer to us than Wolf 1061, those planets are not considered to be remotely habitable," Dr Wright says. 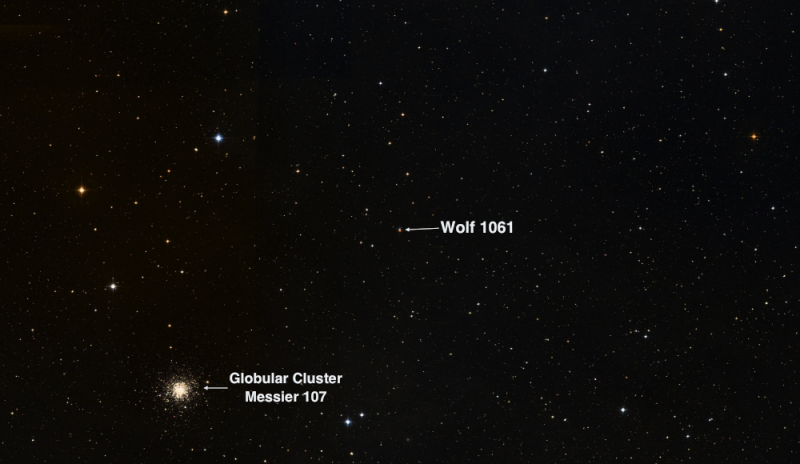 Sky area in the constellation of Ophiucus near the red dwarf star Wolf 1061 which includes the impressive, but unrelated, star cluster Messier 104. Wolf 1061 is 14 light years away. The UNSW team made the discovery using observations of Wolf 1061 collected by the HARPS spectrograph on the European Southern Observatory's 3.6 metre telescope in La Silla in Chile. "Our team has developed a new technique that improves the analysis of the data from this precise, purpose-built, planet-hunting instrument, and we have studied more than a decade's worth of observations of Wolf 1061," says Professor Chris Tinney, head of the Exoplanetary Science at UNSW group. "These three planets right next door to us join the small but growing ranks of potentially habitable rocky worlds orbiting nearby stars cooler than our Sun." "The close proximity of the planets around Wolf 1061 means there is a good chance these planets may pass across the face of the star. If they do, then it may be possible to study the atmospheres of these planets in future to see whether they would be conducive to life," says team member UNSW's Dr Rob Wittenmyer. I read somewhere that habital planets around red dwarf stars are unlikely because the planets have to be close to the star to be in the 'goldilocks' zone which is too close for life to survive the solar activities of said red dwarf. Wolf 1061 lies 13 ly away, so it is halving the distance to Gliese 667C, or potentially quadrupling the number of nearby habitable planets. @tblakely: Yes, there are two major identified problems with red dwarfs stars, ~ 90 % of them are much more active at the beginning of their (main sequence) star life than our Sun and habitable planats may be tidal locked to them. But those are weak problems. The solar activity problem is pretty much a zero sum game because it means larger planets (as here) will tend to retain a Goldilock atmosphere after the active period. And only about half the planets will tidal lock instead of being captured in a resonance like our own Mercury, and even with tidal lock (again mostly large) planet atmospheres tend to redistribute the day side heat anyway. The jury is still out, but some recent modelling papers (AFAIK) are cautiously optimistic that most of these planets - who are the majority of potentially inhabited planets (red dwarfs stars being 80 % of stars) - are habitable. TL;DR: I wouldn't worry too much about the theoretical problems. Hopefully we can see for ourselves in 2-3 decades (if many such planets have life). Oh, this is great and all but without an advanced and long term, long distance space travel option it's just a novelty. Fusion please. As interesting as the Wolf 1061 system appears, I would still put Alpha Centauri at the top of the list. There are hints of another planet around Alpha Centauri B. If it's about looking at potential habitable planets I'd disagree, a triplet star system can hardly provide a stable environment for habitable planets. Just a thought... wouldn't the orbit frequency of a planet be taken into account when considering habitability? @phprof: "without an advanced and long term, long distance space travel option it's just a novelty." No, it is a very successful line of research into conditions of life in the universe (astrobiology). Technology is great and all that but over astronomical distances economically/scientifically feasible travel is a pipe dream. (Though colonists may not care about economical value.) Reality please. By coming to Pluto we were surprised and stunned by our ignorance. What is the body further away from us, we are all a safer and cleverer. The methods are good, but skepticism please. This is bottom of the barrel as far as habitability goes. The atmosphere will likely be at least 2.5 times that of earth. That close to it's star the temperature is surely above 100C. Not to worry though the pressure will keep the water liquid. Just don't try clean yourself with it..
Flares we know about. Did someone mention the Constant hurricane winds present as the day and night side atmospheres balance out the heat. Even the Saturn's moon Titan is more habitable (all you need is power source for heat & 0x generation. Yes even more habitable than Mars. Just having a power source on WOLF 1061c, to cool wont help much. Because you cant effectively cool In such an atmosphere unless you had massive and tremendously complicated apparatus per cubic feet of habitat and would still use a lot of power. Technology is great and all that but over astronomical distances economically/scientifically feasible travel is a pipe dream. I suppose an interstellar mission philosophy of "it's impossible, but we're going to see how far we can fling dead astronauts into space for science" wouldn't be too popular with the public. I would love to be the first human ashes to make it a lightyear, however. Clyde Tombaugh is already 35au ahead of you, but he still have over 30000 years to go before he reaches this boundary line that you are now contemplating. So! Long live to you, a good ship at the end of it and godspeed.